We work with the Flying Star method. This method is the most powerful and the fastest. Results are obtained within three months maximum. In simple terms, let us say there are eight directions, (North, North-East, East, South East, South, South West, West, North West). These 8 directions together with the centre, scaled down to correspond to your home, represent 9 sectors, 9 squares which make up a large square. In each sector are eight directions. 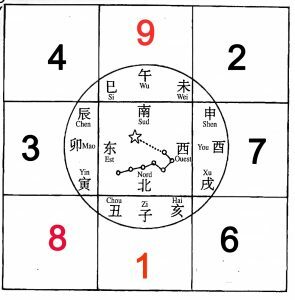 For the Chinese, historically the North Star has always been very important, hence it is the movements of the Great Bear which will commingle with the earth’s plateau, the 9 stars of the Great Bear (7+2 satellites) which will become the 9 sectors of your house. These are called the Flying Stars and each one has its own characteristics and influences, positive or negative. These movements follow time cycles of 20 years, but also yearly, monthly, and daily cycles etc. We concentrate on the 20-year-old stars (2004-2024). After a consultation with us, you can relax until 2024. Just one consultation is enough and that is our strength. However, if you to choose to delve deeper into Feng Shui, we offer an annual update on the 3rd of February. Our objective is to place you in the best orientation in the best sector. This is especially important for your bed, your desk and your sofa. We reduce the influence of negative stars with cures and accentuate the positive stars. With this method, it is essential to determine the exact position of the front of the house. Otherwise all our calculations will be wrong. Time-related factors are also fundamental. By following the Chinese calendar according to the direction of the house, the astrological sign and the PaKua of the inhabitants, we are able to give precise dates and times when it is necessary to position the bed or the desk. This is a common practice used in Asia to decide a wedding date, the best time to build a house or for renovation work to start, the date for starting up a business, etc. 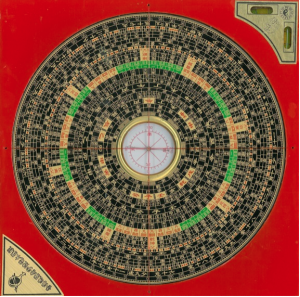 We also work with the Form School method (the environment of your living or working space) the Bagua (the 8 hexagrams of the I Ching), the 8 palaces (areas in the home rather than the directions) the 5 elements (the cycle of engendering and weakening), the balancing of Yin and Yang and the Void, necessary for all beings. In the school of Chinese thought, each new theory is absorbed by the old in order to create a new one. If there are contradictory elements, we favour the practice which is the strongest, which in this case is the Flying Star practice. So Feng Shui is a complex art and we, as Feng Shui consultants, deal with the calculation and amalgamation of the different methods. We provide you with a clear floor plan of your space, updated according to Feng Shui, and a written report summarising your Feng Shui analysis and remedies.